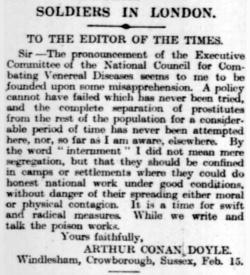 Soldiers in London is a letter written by Arthur Conan Doyle first published in The Times on 17 february 1917. See also his first and second letter on the same topic. Sir, — The pronouncement of the Executive Committee of the National Council for Combating Venereal Diseases seems to me to be founded upon some misapprehension. A policy cannot have failed which has never been tried, and the complete separation of prostitutes from the rest of the population for a considerable period of time has never been attempted here, nor, so far as I am aware, elsewhere. By the word "internment" I did not mean mere segregation, but that they should be confined in camps or settlements where they could do honest national work under good conditions, without danger of their spreading either moral or physical contagion. It is a time for swift and radical measures. While we write and talk the poison works. Windlesham, Crowborough, Sussex, Feb. 15. This page was last edited on 11 July 2016, at 13:37.